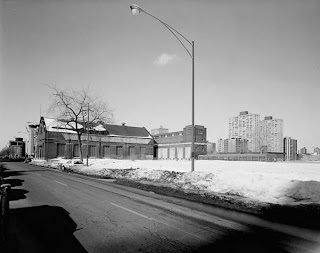 The Lake View Pumping Station was located on the northeast corner of Clarendon and Montrose. It supplied a large portion of Chicago's water needs during the first half of the twentieth century, with a capacity to pump 25 million gallons of water a day. The first photo dates to 1904, and shows the original station, which was built for the city of Lake View in 1875. 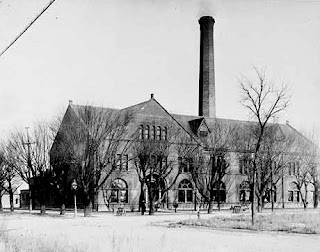 Lake View was annexed to Chicago in 1889 and a new pumping station was built between 1907 and 1915. The pumping station stopped supplying water to the city in 1964, and was torn down in 1978. The second image was taken that year, and is looking west down Montrose toward the station. It's interesting to see Imperial Towers in the background here... It's much different at that intersection now with the gym and Jewel! That is a great photo, but that's not Imperial Towers. Those are buildings north of Montrose on Clarendon. I went a temporary grade school built just East of the station, called "The Cottages". Looking for a picture.